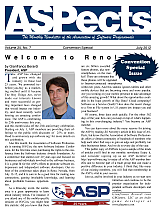 The ASPects newsletter is sent to ASP members each month. The entire 25-year history is available in PDF format in the members’ archive, and is fully-searchable. But this month is different–the July issue is a free download for everyone, not just members of the Association of Software Professionals. The biggest mistake you can ever make is to wing it alone. If your software asks users to create a password to protect the privacy of their information, then you have an opportunity to offer additional value to your customers. And that can mean increased software sales, additional recommendations, and good will for your company in your marketing niche.